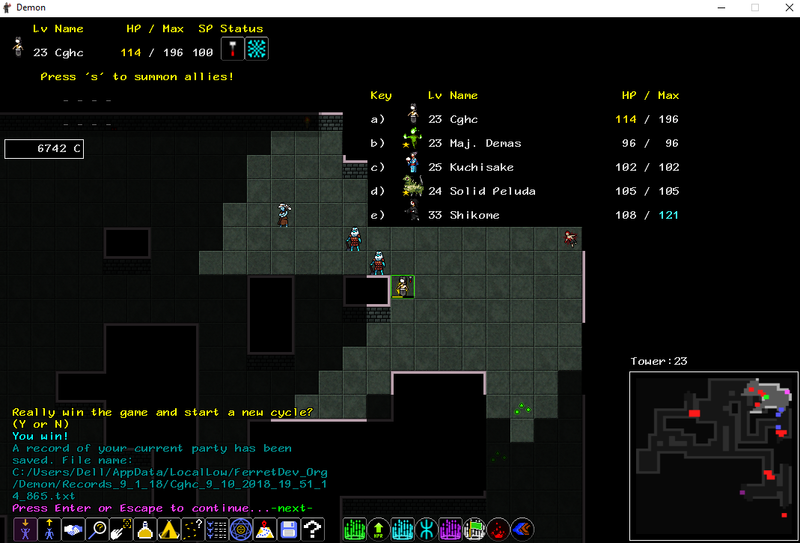 forum.ferretdev.org » View topic - YAVP: Faithful heart, healing and fire. 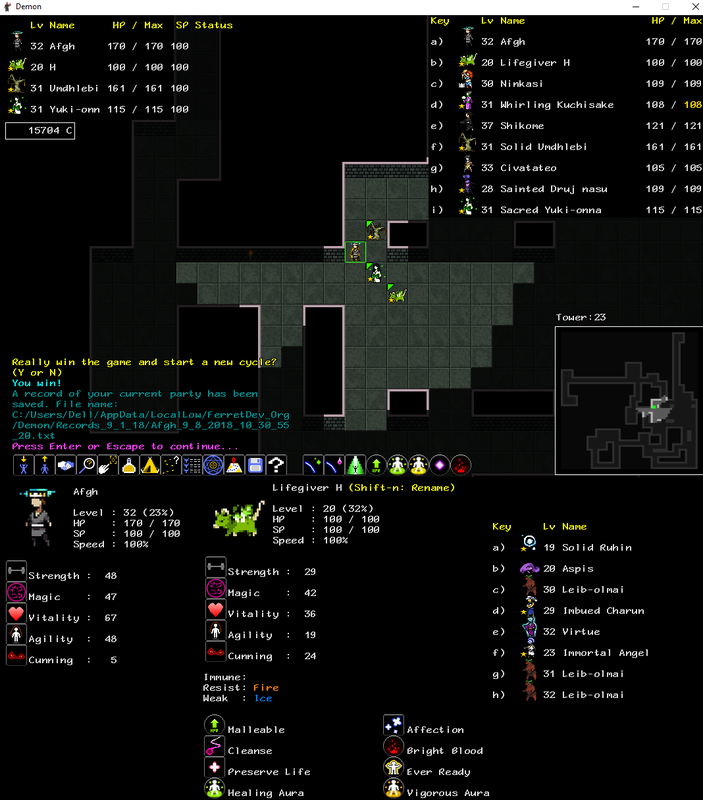 Re: YAVP: Faithful heart, healing and fire. Humble little Hinder getting love? That almost never happens! You make a good case for it on a Tormentor though. on the Polar Rush escape. Though your Hob doesn't likely agree, it seems a pretty smart move to me. A dream of the future! How strange... but perhaps of a future parallel universe, where I somehow had animations in this thing. But yes, the Matter build will be soon now. I hope to knock out many of the needed sprites this weekend. Next week's going to be heavy at work, but I should have a nice clear spell after that to finish things up in. I've managed to get a victory in the test build. Note: "Mom" is a cheesy pun of "mind over matter," because I went with a matter + mind start. This was a straightforward run. I think I managed to defeat everyone, barring Antoria, Tremane, and a wraith I had left in the late Tower. I managed to nab the Archangel with a silver offering in Rush's Sanctum, from which he managed to be a big help for the next several floors. He did die in Anansi's sanctum, though, and before that he got drained badly by Fetches (albeit he was okay enough to be in battles in the lower Tower anyway). As for my own character, I focused a bit on wrapping my enemies; early on I disregard black out, the blinding attack. To get into combat quicker, I had harass, which would be replaced by Haunt by the time it'd be over a thousand credits expensive (about Ninkasi's Sanctum IIRC). I also managed to complete the Reprobus link for the first time in a while, and I decided to get Crippler from Mordecai. With that and the wrapping of Razor Whip, quite a few enemies were beaten nastily. Even though my party wasn't totally balanced, given that for large stretches of the game around a third of the elemental types weren't a part of my part's abilities, they did fine. An early archangel would make the early game a breeze, although around the mid-Tower it wasn't always a good answer to every problem. 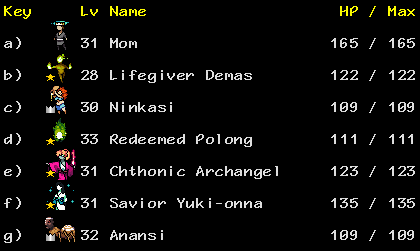 In this run I actually did prepare a little to deal with Shikome in the late tower; a few runs ago I had another Crown character who got ganked very badly into death by a few of them. At least with allies like Anansi panic and whatnot can be spread among them to delay their damage potential. On that note, I completed the Anansi link with relative ease: the sanctum was empty otherwise and I had Haunt to keep up with him if he was starting to get a few spaces too far. He did die once on the final floor though, making him and my Archangel the only members of my final party who were revived at one point. Anyway, my ganked Crown character was summoned with a ghost chime and my party could hardly do anything to his. With a healing destroyer demas and a supporting mindbender Kuchisake (named "Ruhisake"), not to mention Bright Blood + Malleable everywhere, his party was a total brick wall capable of recovering lots of HP after taking lots of damage and shrugging off most of my party's limited range of status effects. They weren't that hard to run away from, though, but I wasted a lot of glyphs and runes in the fighting. I'll say that I've been enjoying messing around with Matter so far. I've been focused the most on Binding so far, but I'm wary of what the other tricks can do. For example: I find it a bit neat how Blinding is a new means of messing with ranged attackers and healers. Even months before these test builds would be released I noticed that Matter seems to be openly based a lot on ability synergy, which would probably make it a good element for learning that. I've said before that even if I have won a lot, I feel like there's so much more tactics I have yet to figure out. That aside, there's also the inclusion of matter as a resistance and a weakness, which changes things a lot here and there. Now we can have fiery asrais! I'll admit that I'm a bit surprised by what got matter somewhere in their resistance tables; I was expecting demas to have matter resistance, but not ogres. Congrats on the Matter test build win. Ooof yeah, Razor Whip + Crippler would pretty much wreck a target's physical defenses. Early rare monster recruits are pretty special. Having an offering available + them spawning makes them rare, so I don't mind them having a decent-sized impact similar to an early game artifact in other games, but it's good to know they do indeed have an expiration date as intended. I'm glad you've been enjoying playing with Matter so far. I hope there's plenty for you and the other players to explore in for some time to come. Weak to Matter: Small and/or soft creatures. Resistant to Matter: Especially solid or large creatures. Immune to Matter: Creatures without physical form, or extremely solid or large creatures. It's been a while, but I have been still playing Demon over the months every now and then. I just haven't really bothered with posting about anything. This run was a bit different than usual because I had prioritized magic over other stats, which made Soothing Cut provide better heals. It's actually pretty useful when it can be applied. 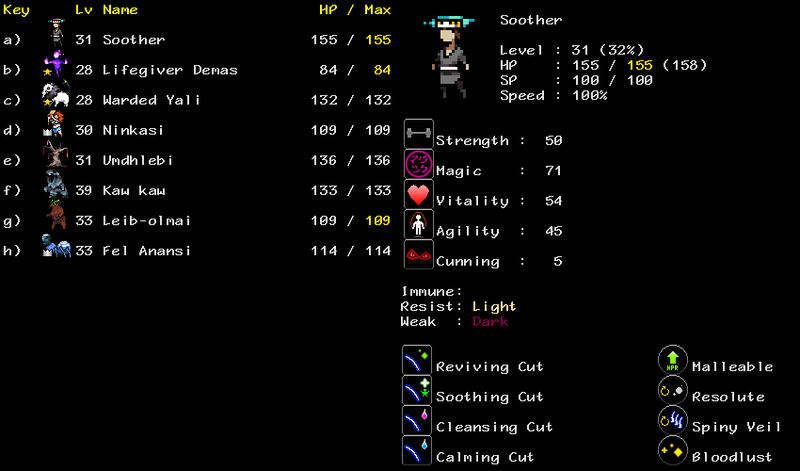 In the late game it healed for a rough estimate of 25 HP on average and up to 35 HP, which is quite a bit. I also had Calming Cut, which was fine, but for some stretches of the game I had no other Calm users. In hindsight, I probably should have traded Reviving Cut for something else halfway through the game, as it didn't have much usage in the later Tower. It was a pretty solid run, though. This game had been happening over a few weeks so I can't remember every detail, but because I managed to get a Nokken and a Kaw kaw at Anomaly, I was able to clear almost every floor. My party was overall solid, but some ability types had very little users, like the trinity of fire, ice, and electricity. Hey. Glad to see the post, it's gotten a bit quiet around here. I expected it eventually with how much work has slowed down development relative to previous speeds, but yeah, I'm always happy to see a new report. Support Slasher. But yeah, the Magic is higher than I've usually seen for that. I wonder if you'd have found Preserving Cut (opposite of Soothing Cut, in terms of usage limitation) more useful than Reviving Cut in the later Tower floors. Glad you had fun, and congrats on the win. Thanks for the report, as always! >I wonder if you'd have found Preserving Cut (opposite of Soothing Cut, in terms of usage limitation) more useful than Reviving Cut in the later Tower floors. I can imagine that it can be pretty good at helping allies out of low HP with enough magic investment. I am looking forward to the next update as a lot of the abilities look pretty interesting, like the chain chill cantrip. Hopefully won't be too much longer before the next update, but on the other hand, if it is, it'll probably be because I was cramming in more abilities, so sort of win/win? This image is so large I may as well link to it. Anyway, this is my first victory for this new build. "Afgh" refers to the keys that made up this character, hence why I have a huo shu named "H." This character came to favor magic some because at one point early one I got to pick up mending. I think it was a worthy investment, as mending helped in quite a few situations with getting my party members out of trouble; of my final party, only my druj nasu and yuki-onna died at all, and the former died twice. My huo shu made for a decent healer, and I positioned it well enough that there were only a few times where it was close to death. With my PC and huo shu having healing aura as well as a sainted druj nasu with healing aura, and nightingale, my team had some good access to heightened regeneration. When it stacks up its healing does becoming more noticeable. When it came to other healing auras and iron heart, I didn't notice their effects as well, probably due to my typically hasty playstyle. I do think this update changes things quite a bit; a lot of the game is still familiar, but there's who knows how many new approaches to situations, and I'm starting to get familiar with the new dangers that come from the added abilities. IIRC, I only had to skip fighting Madevra, Mordecai's band, and half of the penultimate floor because of Madevra. I also skipped Tower:21 which had a corpse wraiths and two mirror wraiths. To my surprise, I did manage to defeat a wraith on one of the last two floors which had me cornered because I was in a small room at the end of a corridor and it spawned at the exit. Anyway, it's been fun checking out this update so far. I've already tried some new things, but I have a lot more to learn. EDIT: I forgot to mention that the miracle buff ability is quite strong. I acquired it from the charun and put it on my yuki-onna. It had seen much usage on the final few floors and really helped a lot with battles. A little Huo Shu made it all the way to the end. Nice! I'm glad you're having fun experimenting with the new auras and other abilities. Many of the auras can be a bit subtle, but I think most of them work pretty well. Definitely still some room for tweaking/adjustment though, like I was telling OneEyedJoe earlier, they're a "new" concept balance wise, so I know they aren't likely perfect yet. Little confused on the heroes rundown... you said you had to skip Madevra twice, did you mean Valindra for the second Madevra? She prefers to spawn on Tower:22 so it'd match the rest of what you said. I'm happy trusting the AI with a Miracle worked out well, even if it was the easiest Miracle for it to handle. Miracles are a tough problem to code AI for since they're shut down after use, but at least I have maybe one working right. >Little confused on the heroes rundown... you said you had to skip Madevra twice, did you mean Valindra for the second Madevra? She prefers to spawn on Tower:22 so it'd match the rest of what you said. Derp. I must've gotten them mixed up. I know I hardly bothered to proofread that post so that's probably why such an error remained. This had been another pure vitality buffer, the other build I've come to be familiar with. I think it was in or right after Medusa's Sanctum in which a large chunk of my party had been slaughtered and I felt that I would have some major difficulties in recovering, so I decided to bolt for the ending as I had enemy sense. Among those lost were my lifegiver kitsune, which I managed to nab and modify all the way back in Vikhor's sanctum. I did manage to make it, luckily enough. Having mobility helps with outrunning most enemies a lot, which I had instead of the more usual oppressor nor resolute, the latter of which didn't show up on any modified enemies. 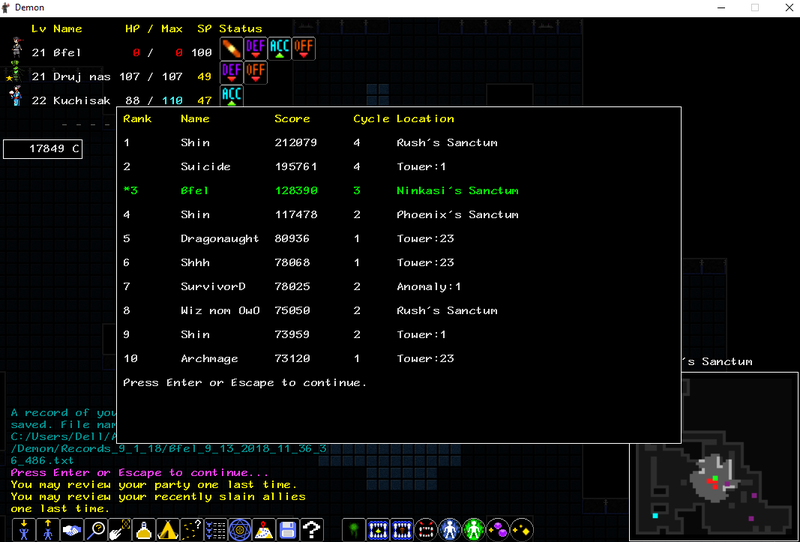 My third cycle was going pretty strongly up until Ninkasi's sanctum. I do think I was starting to stagger a bit around then, but my party became a bit overleveled and was capable of taking out many enemy wraiths because they'd be weaker. Ninkasi's sanctum had proven to be the bane of this character, though. I think this had been one of my best Eye of the Dragon runs yet, in which it came to favor physical attacks and had a couple straightforward debuffing auras. I didn't use Hinder much starting around halfway through Anomaly, so I think in hindsight that I probably should have replaced it with another ability this character could have used and benefited more from. In the end, my efforts still put me on third place on the high scores, so that's impressive.